Not sure how the above symbol depicts The Lovers? Click here. Christian: The Lovers depicts the struggle between the passions and conscience. Lévi: This hieroglyph depicts man between Vice and Virtue. Above him shines the sun of truth, and the sun is love, bending his bow and threatening Vice with his shaft. Papus: This hieroglyph expresses the struggle between the passions and conscience, the antagonism of ideas. But this antagonism is also the most powerful natural producer that exists in the world, when it resolves itself in Love. Felkin: This card depicts the impact of inspiration on intuition, resulting in illumination and liberation. Illustration (right): The Lovers from The Hermetic Tarot by Godfrey Dowson (copyright &COPY; 1979 U.S. Games Systems). Click the image for a larger one. Waite: The Lovers is in all simplicity the card of human love, here exhibited as part of the way, the truth and the life. In a very high sense, the card is a mystery of the Covenant and Sabbath. Wirth: This Key shows us a young man standing still at the meeting of two roads. The Lover hesitates, urged by an austere queen who only promises moral satisfaction and by a bacchante, the provider of easy pleasures. 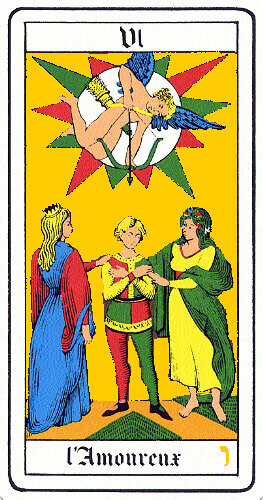 Illustration (right): The Lovers from the Oswald Wirth Tarot Deck, adapted from the work of Wirth (1889) (copyright &COPY; 1976 U.S. Games Systems). Click the image for a larger one. Case: The title of this card intimates the union of opposite but complementary modes of existence. in Thine own Soul; hear thou it. Gray: Choice between diverse allurements; the struggle between sacred and profane love. Attraction, beauty, harmony of the inner and outer life. The power of choice means responsibility. Sadhu: The great way to the Macroprosopus is through ecstasy. ONeill: The Lovers might represent Choice: love vs. agression, esoteric vs. exoteric, unconscious vs. conscious, marriage vs. celibacy, ecstacy vs. theology, mystery vs. philosophy, etc. However, there is another aspect to the card beyond Choice. The presence of both male and female and the suggestion of love could also indicte marriage: the union of the opposites, rather than a choice between extremes. Pollack: The traditional version of The Lovers represents adolescence. The individual emerges, a true personality with its own ideas and purposes, able to make important choices based, not on parental orders, but on its own assessment of desires and responsibilities. Turk: By unifying your thoughts with your dreams, your abilities with your visions, you engender a potent genius, the child of this marriage. Symbol (top): Depicted is Cupids arrow, a sign of love, which often comprises, in part, this Arcanum.